Hi everyone. This is my first posting here. I recently purchase a 2015 GMC Terrain Denali that is front wheel drive and has the 2.5L L4 direct injection engine. The vehicle has 9,000 miles on it. Having read on a few other sites where some folks have had oil consumptionissues with the 2.5L L4 engine on earlier models. Has this issue been resolved with the later models? Are there any other concerns with the 4 cylinder I should keep an eye out for? I really love this vehicle. I've put on about 1,000 miles so far. Fuel economy is surprisingly good. City driving is about 25 to 27mpg and highway 29 to 33mpg. The performance with the 4 cylinder and the 6 speed auto trans is very good. I find the Denali package nice. We put our 2015 GMC Terrain SLT 2.4l AWD through the ringer on a 6,000 mile trip out west and back and never experience even a hick up. Actually with it coming up on lease ending 45,000 mile date the end of the year my wife says it was the best and most like car she has ever owned. It has only returned for free maintenence and never had anything fail or never had to go in for warranty work or recalls like everyone else seems to have. I was watching the oil level on the dip stick as climbing the Rocky Mountain range at 80-90 mph pace but it had no problems doing 5,000+ rpms for miles on end. With two adults and a dog and the cargo space full along with a pair of bicycles hanging off the back, we were not close to working the 4-cylinder and AWD. The Active Noise Cancelation helps combined with the long wheelbase to make 10-12 hour days a breeze. Comfortable seats too! 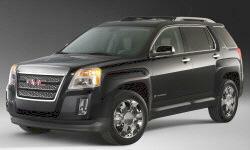 We love our 2013 GMC Terrain SLE with the 4 cyl engine. We have had no problems and believe that the AWD is not needed as our front wheel drive does great in the snow.The ride and gas mileage are great. We really enjoy the GPS mapping and would buy this exact car again.